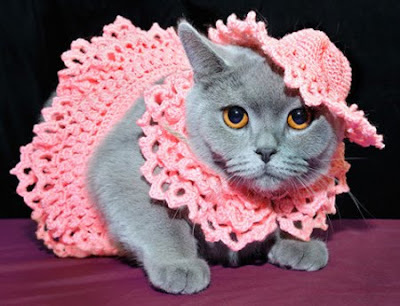 That is so bizarre because this evening I put my pearl (fake) necklace on Widget and she looked sooooo beautiful and she knew it...but my family thought I was mad...not as mad as dressing a cat in crochet though! Oh how adorable and sweet! KISSES! hehe, so sorry little cat. we are not seeing a very happy face there. maybe you were a boycat and they forgot. if we call Seinfeld's Soup Nazi to your rescue, he will yell, "No crochet for YOU!" Next time I see mum wid her Crochet hooks, I'm running. You look faaabulous in pink, my dear!